Yesterday was one of the last cheap film Tuesdays these hols, and the chance for some catchup. Watching it, I was struck with the comparison (not shown in the film, just a thought which came to me) between the Queen and Mrs Thatcher; the longevity of the Queen's work and duty, and her ongoing vitality and busyness of life even in age; whereas Mrs Thatcher, more affected by the ailments of age, is now a widow whose public life had to be grasped rather than being granted and who now leads a quieter, more confined life. Not a better or worse comparison, just an interesting contrast to ponder. The Swedish original films with Noomi Rapace are still in my memory as very good films. This was very good too: not better or worse, but very good in its own presentation/version of Stieg Larsson's book. Still struck by those landscapes at the beginning of the film, in both: the monochrome of a snowbound winter. In both versions, the faces are landscapes too. I read one review which commented on Daniel Craig's Bond-like competence and calm as Mikael, which implied a rather too Bond-like competence and calm for a journalist; but in the book Mikael has done military service, he knows his way around weaponry from that time, so I didn't find this incongruous or unlikely. I didn't feel or think as though I was watching Bond solving the Vanger family mystery. I don't especially hunt out 3D films - I saw Avatar in 3D at the multiplex and then later in 2D at a little local cinema, and it was quite as satisfactory in 2D. Reviews had said, however, that Scorsese had done wonders with 3D with this film, so I took the funny-specs line. I know of the book, but hadn't read it all the way through, so the story was a mystery to be unravelled (and I wouldn't know plot points to tick off). A delightful film. Again, well written, well acted, a pleasure for eyes and imagination. 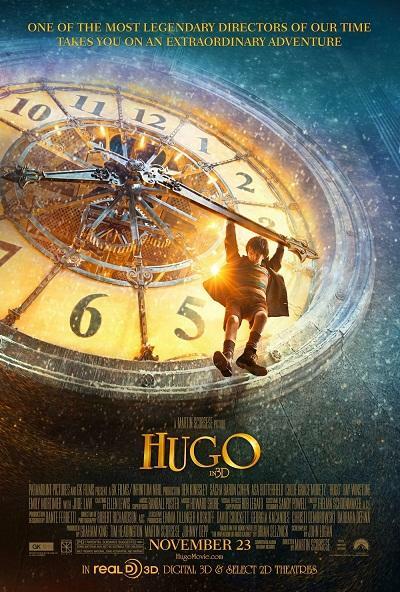 Asa Butterfield is excellent as Hugo. The automaton was an intriguing character, not just a plot device (and I was fascinated to learn, with some googling, that what it does in the film was not CGI: it was built to do that complex task - amazing workmanship by its builders) (I'm avoiding telling you a spoiler. See the film before you google!). Some people had brought very small children to the cinema, and I'm not sure that it's quite the film for them; but for older children and adults who enjoy thoughtful stories...lovely. A diverse trio of films. Exploiting cheap Tuesday is a good thing when there are films worth seeing (which is not always the case in school holidays).